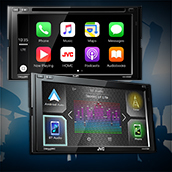 LONG BEACH, CALIF., March 28, 2017 (MEDIAWIRE) – JVC Mobile Entertainment announced that its highly anticipated pair of flagship multimedia receivers, the DVD-equipped KW-V830BT and mech-less KW-M730BT, will begin shipping this week after receiving third-party software approval. The receivers represent the company’s first units equipped with the combination of Apple CarPlay™ and Android Auto™, designed to accommodate owners of an iPhone® or Android™-based smartphone who use their devices for everything from streaming and stored media to turn-by-turn navigation. The KW-M730BT is also JVC’s first dedicated digital media receiver. Both models feature the El KAMELEON flat-face design, which better integrates with newer dashboards and deters theft. The 6.8-inch clear resistive touch panel includes a virtual viewing adjustment feature that offsets angled installations. For safety, a rear-view camera can be added to show the area behind the vehicle when backing up. Entertainment-wise, both are SiriusXM®-ready and connect to the SiriusXM Connect SXV300 satellite radio tuner (sold separately). They will also connect to two smartphones simultaneously via Bluetooth to make hands-free calls and play stored or streaming content, and control popular streaming services Pandora Radio®, iHeartRadio and Spotify® directly from the receiver interface. In addition, smartphones and storage media can connect through two available USB ports, which also charge select devices. The duo’s audio processors can accommodate several audio file formats, including 192kHz /24-bit Hi-Res Audio and FLAC (Free Lossless Audio Codec), and Sound Adjustment works to enhance sound quality and optimize the listening stage. A thirteen-band equalizer carries 12 presets for most music types. Built-in amplification (50 watts x 4), high- and low-pass filters, and three sets of four-volt pre-amplified outputs make each receiver an easy upgrade for most standard audio systems. The KW-V830BT carries an MSRP of $599.95, while the KW-M730BT retails for $499.95. Both units will be on display in the JVC booth at the 2017 KnowledgeFest Spring Training event, April 9-11 at the Indianapolis Convention Center. For more information, visit mobile.jvc.com. JVCKENWOOD USA Corporation is a wholly-owned subsidiary of JVCKENWOOD Corporation and is a leading developer of imaging, home and car entertainment, and navigation products for the consumer market, two-way radio communications systems for public safety, private industry and amateur users, and video equipment for the broadcast and professional markets. For detailed information, call JVCKENWOOD USA at 1-800-252-5722 or visit us at http://us.jvckenwood.com, www.kenwood.com/usa and www.jvc.com. • "We are excited to bring expanded iPhone and Android support to JVC Mobile retailers and customers. Smartphone-centric drivers can now combine their stored and streaming content with a receiver that is made for entertainment, creating a truly immersive in-vehicle experience."